It is so clear from this scripture that St Paul saw his primary responsibility as preparing the Church as a precious Bride, a pure virgin, for the Lord Jesus Christ who was indeed Her husband, the Bridegroom King. In fact he claims to have promised Jesus that and he looks forward to the time when he is able to present Her to Him. He consequently is jealous over Her for he states quite emphatically that She has one husband. There is a passion in his words and an intense sense of focus. All pastors and ministers would do well to embrace the same clarity of understanding regarding their mission. This is what they too are called to do. Now if Jesus is returning, as we believe He is, and is returning to take us to the Wedding of the Lamb and He is the Lamb of God who takes away the sins of the world, then it is to His own wedding that He will go and we too. He being the Bridegroom and we the Bride. However scripture also makes it so clear that He will only return when the Bride has made Herself ready. “Let us rejoice and be glad and give him glory! For the wedding of the Lamb has come, and his bride has made herself ready.” Rev 19 v 7. But notice it says …”His bride has made Herself ready”. God has not made Her ready. Privilege always carries with it a sense of personal responsibility. To be chosen to be part of that Bride is indeed a privilege. It is to be called even now into such a deep intimate and personal relationship with Jesus, who is the King of Kings, the apple of the Fathers eye, the fullness of the Father’s glory, the One who is above all things and in all things, and is very God of very God, creator of the Universe. It is beyond our understanding. Then, after the Rapture and the Wedding Feast, we will not just be in His presence and see Him as He is, but actually be made One with Him in a way that only the marriage relationship can begin to describe, where the Father declares that…the two have become one. The mortal history of the Church is heading up to this event. After the wedding feast the Church enters a new dispensation when She has become immortal. She returns and reigns with Him on planet earth in the millennium, in Her new glorified state…..empowered, fully anointed in perfect synergy with Him. As scripture says …this is when…”the Kingdoms of this earth become the Kingdom of our God and His Christ” This is the destiny of the Bride! God in His wisdom and because of His grace has sent the Holy Spirit to teach and lead us, to baptize and equip us with His gift and to conform us to the likeness of Jesus by developing the fruits of the Spirit within us. We have all we need to be prepared and to make ourselves ready. 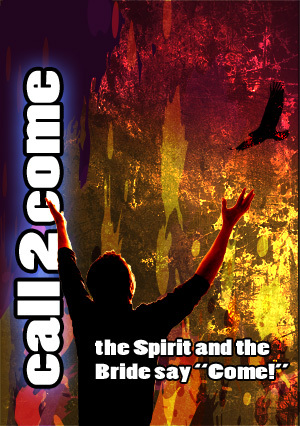 Call 2 Come is dedicated to firstly 1) Awaken the Church to Her Bridal Identity 2) to challenge Her to “make Herself ready” and 3) to position Her to cry the cry that only the Bride can cry….Come Lord Jesus Come! For it is only the Bride in unison with the Spirit that can cry Come! This is the end time and season we have entered and our response to it can either hinder or hasten His return.